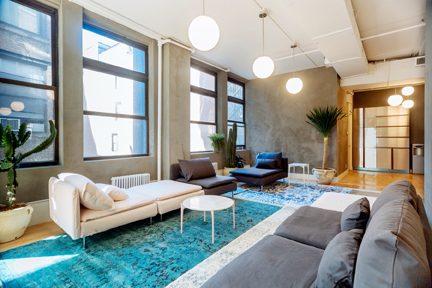 Mammoth Projects is a full-service interior design and architectural design practice based in Williamsburg, Brooklyn. We specialize in creating unique, and functional office and commercial spaces for startups, and other creative teams. We're currently working on projects around NYC, and Tri-State Area, The Hamptons, and New Orleans. We pride ourselves on working with a diverse group of teams, and at all budgets. We will work with your team and budget to select and/or design the furniture for your new space. We'll work with you to design the floorplan that meets your team's needs. And fill it with the accoutrements to make you want to come to work. If filing is required, we'll walk you through the process, and get the right folks on board. We work with great teams to ensure the execution is as seamless as the design. We'll recommend contractors, procure competitive bids, and show up to make sure construction goes smoothly. The bar and lounge at Anomaly New York - located in a Landmarked Soho building - the design draws inspiration from the historic details of the space as well as the advertising company's eclectic tastes. The brief called for a private bar and lounge for the Ad Execs, their clients and, the staff. The build-out focused on highlighting many of the loft’s original details: restoring the plaster walls and columns, while framing them with modern finishes and accents. The neon sign is 10-feet high and rests between the restored base and crown mouldings. We covered the bathroom walls, floors and ceiling in an inexpensive tile we found at Home Depot. When making a budget stretch, we sometime rely on an old dictum: "quantity has a quality all it's own." ANDELA ANDELA IS A YOUNG COMPANY THAT TRAINS DEVELOPERS IN AFRICA, AND CONNECTS THEM WITH WESTERN COMPANIES LOOKING FOR TECH TALENT. To keep costs down, we kept the existing kitchen cabinet bodies and replaced the kitchen faces with dead matte, white oak. Different-sized black steel finger-pulls and a black-painted oak backsplash complete the look. Nuts.com began as a nut cart operated in Newark’s Penn Station by the CEO’s grandfather in 1929. A family owned and operated business, 90years on, the company has never forgot it’s humble beginnings. As a nod to this tradition, we focused on recreating some of that experience in the heart of food company’s office, with a contemporary twist. THE WALLCOVERING IS A CUSTOM PRINTED MURAL OF PENN STATION IN NYC – BUILT AT THE SAME TIME, AND BY THE SAME ARCHITECTS (MCKIM MEAD & WHITE), ALSO AT AROUND THE TURN OF THE LAST CENTURY. THE MILLWORK BECAME A STAND-IN FOR THE CART: BRIGHT YELLOW CABINETRY REMINISCENT OF BRIGHTLY COLORED VENDORS IN PUBLIC SPACES. We carried the theme of exploiting the company’s history, and penchant for color, throughout the space. The company’s packaging -designed by Pentagram - was the inspiration for the color used throughout. DYNAMIC YIELD FOR A TECH COMPANY WHO RECENTLY RAISED ITS SERIES B ROUND, WE BUILT AND OFFICE THAT "FELT LIKE HOME". BOND STREET To create an office that reflected the style and personality of its young staff, the design of Bond Street's Soho office was inspired by the company's first clients. Each meeting room is named for a small business that Bond Street worked with when first opening it’s doors, and is styled to reflect their varied tastes. The main office space ties it all together with a clean, white on white aesthetic and a nod to the industrial past of the building and neighborhood.